seawapa.co: The City of London, the Jesuits, etc. The City of London, the Jesuits, etc. The Dame of Malta, Elizabeth Mary II was the head of the Committee of 300 and thus the Commonwealth Crown but this changed in 1975. Jesuit trained King Juan Carlos of Spain took control of the power in 1975 when the Jesuits reinstalled the House of Bourbon. The House of Bourbon is the second oldest monarchy on Earth behind the Emperor system of Japan. King Juan Carlos is the most important Protector of the Holy Sites of the Latin Kingdom of Jerusalem and a great power over the World from the Middle East to North Africa to South America and more. He controls industries such as chocolate and coffee as well as the international drugs trade through the Exchange Stabilization Fund mastered via the United States aided by families such as the Spring scion. Orsini, the Aldobrandini, the Breakspear, the Somaglia and the Farnese control the Pope. The City of London is a complicated system my friend because it is a sovereign nation upon British soil (Blessed Isles of Albion) like the Vatican is on Italian soil (Saturnia). Where it gets complicated is when you find out there is yet another sovereign piece of land within the already sovereign City of London. This inner core is of course the important New Jerusalem of which Elizabeth Mary II is a member. Within the City of London the Lord Mayor is the King and power along with his court the City of London Corporation. Elizabeth Mary II has zero powers within the City of London and this is why she cannot enter the City in any regalia. She can only wear the regalia in England etc since she has power there but not to the City in the city and has not since 1215. You will notice that the monarchy never seem to wear regalia at all these days, since when did we notice this? Is this because almost all of the land was submerged under water and thus under the power of the Vatican again via the Maritime Admiralty Law system based on Vatican Canon Law. One can be very powerful in one or more places but not another but still have power to attempt to overthrow or counter power in that area to which they do not have power. The Lord Mayor position is changed annually and yes it is manned by a commoner. A commoner can have power over a bloodline if he is connected in a position of power with the money-changers who loan out to the bloodlines. Remember Britain had only £9million in the bank when its debts back in the 1914 were £950 million which was raised to £21 billion by the 1930s. This was the way that the Jesuits and their Rothschild family bankrupted England and bought in the vile Uniform Commercial Code submerging us under water and thus under the Law of the High Sea. From this time onwards Britain came under the Roman Civil Law system and lost its English Common Law by way of deceit, in truth the English Common Law still stands but judges are so corrupt they deny you a real courtroom. Until the nations dump the central banks and the City of London power then we will never be free. We need to also focus on Switzerland which is more openly bloodline controlled such as the Canton of Geneva run by the House of Savoy headed by Prince Vittorio Emanuele IV. Please study the power of the Bank of International Settlements but more importantly the Universal Postal Union which is just around the corner from the Vatican Embassy. Elizabeth Mary II is a Princess of the unHoly Roman Empire (little horn) and she is one of the wealthiest being on Earth, but below Orsini, the Aldobrandini, the Breakspear, the Somaglia and the Farnese combined who control the Pope together with another group called the Priory of Zion who are at war, two emperors fighting for one Throne. Just check out what one of her gold carriages is worth and be shocked to your bones. She is wealthier than the Pope and the King of Saudi Arabia. You are correct about the Guelph bloodlines and she has Germanic connections which are also very important in banking and highly connected to the Roman Empire. It is very complicated when you start entering into the highest levels of this conspiracy. A being with great power can be seen as less than another in some other area but in truth still higher in the grand scale. We have to remember that Monarchs are seen as having a Divine right to rule and thus believe they are connected to God in some way or from God themselves. It is not easy to break that power and replace it with a common man in any way. This could only be replaced by those who believe they are from another God. Who has destroyed monarchies, popes and Governments? 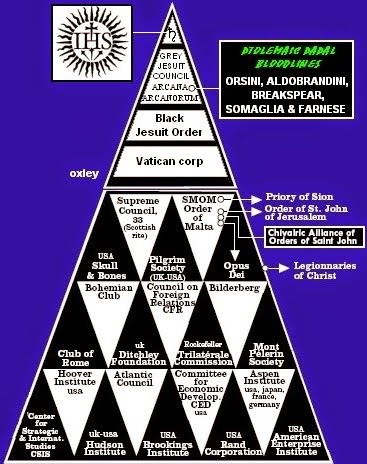 Why it is the dreaded Jesuit Order the masters of the Order of the Bavarian Illuminati using Giuseppe Balsamo and Jesuit sheep-dipped Adam Weishaupt. The Jesuits created the Illuminati to shield their Aragon Templar actions so this organization would take the blame. The Protocols of the Elders of the Priory of Zion was created in Rome in 1491 before the Jesuits were even formed as the Jesuits in 1531.